Rev. 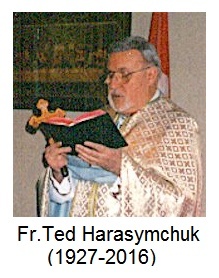 Theodore Taras Harasymchuk – “Fr. Ted” passed away in Toronto on October 4th. He was buried today (Oct. 6) from St. Josaphat Cathedral in Toronto. He served as a Ukrainian Catholic priest in various ways for 64 years. As well as serving as parish priest in many parishes and missions in Ontario and Quebec Fr. Ted had a special place in his heart for the ongoing pursuit of higher education. He both pursued higher studies himself and worked supporting students as a counsellor and chaplain. He also supported the work of the Blessed Vasyl Velychkovsky Martyr’s Shrine in Winnipeg. Funeral for +Fr.Ted at St.Josaphat's cathedral, Toronto Oct 5 Panachyda: 7pm Oct 6 Funeral: 10am +Fr.Ted Harasymchuk (1927-2016) died peacefully Oct 4, 2016 at the +Anderson House hospice (Oakville). He was born in the Ternopil region (Western Ukraine) and emigrated to Canada at age 6. His parents were active members of St. Josaphat's cathedral (Toronto). Fr.Ted attended De La Salle College and subsequently entered St. Augustine seminary. He was ordained a Ukrainian Catholic priest by Bishop Borecky in 1952 and served the church for 64 years in numerous parishes (Toronto, Montreal, Thunder Bay, Hamilton and Oakville). In his retirement years he worked as a student counsellor at Sheridan College (Oakville). For the past six years he lived and served at the Ivan Franko Seniors Home (Mississauga). He will be buried alongside his parents at Mount Hope Cemetery (Toronto). Those of us who have been part of St. Joseph's parish over the past few decades have been touched by his kindness, gentle spirit and spiritual wisdom. Vichnaia Pamiat!